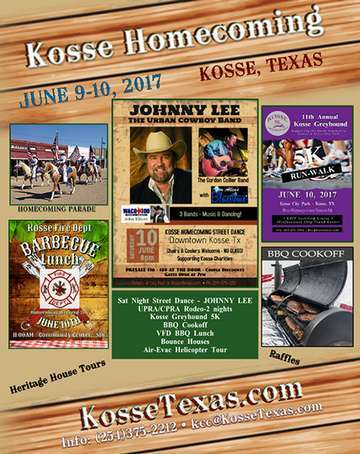 Join the fun and support the Kosse Community Center and local charities at the 2017 Kosse Homecoming Street Dance in downtown Kosse, Texas on Saturday, June 10, 2017! headlined by the legendary JOHNNY LEE & THE URBAN COWBOY BAND! Food & Snacks - Bring Your Chairs & Ice Chests - No Glass Please!